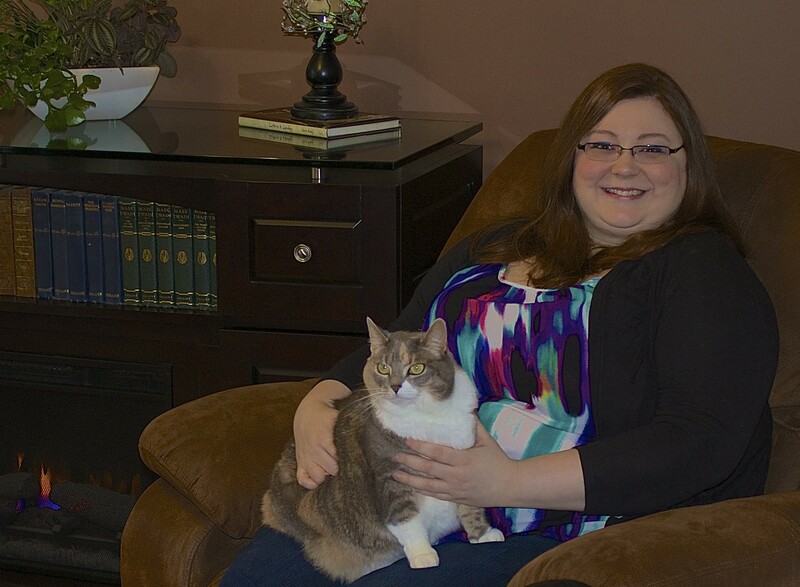 I am Kate McIntyre, author of The Faraday Files series! I’m a thirty-three year old expatriot Canadian living in Central Illinois with my wife and our four cats. I love unicorns, board games, crochet, video games I can play with my friends, and the colour pink. I am represented by Caitlin McDonald at DMLA. 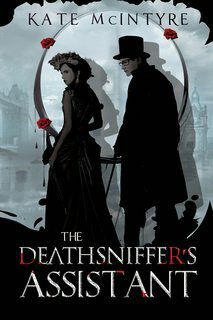 I just completed reading your novel, The Deathsniffer’s Assistant and found it quite enjoyable. I am happily anticipating your follow-up volume and hope it comes out soon! You have built great characters an absolutely expressed them as planned. 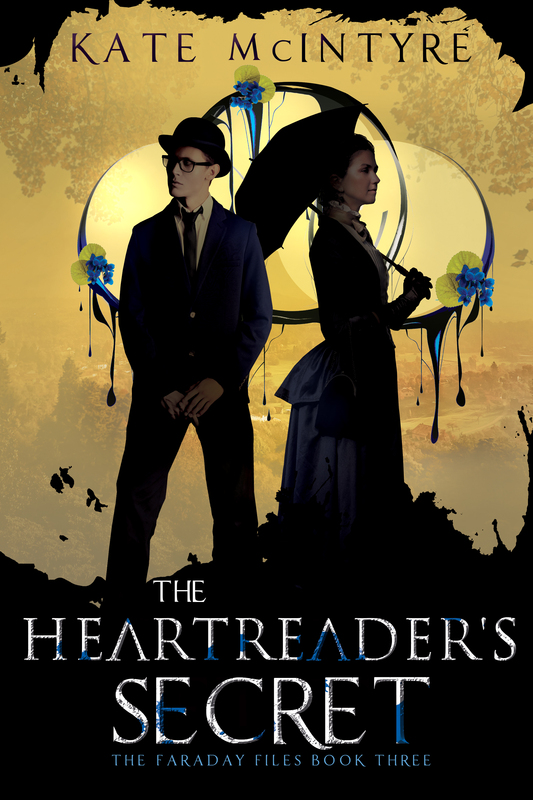 I am especially looking forward to the mystery of William and the hinted secret power of your protaganist developing. 1. the introduction of the Faceshaper concept seemed somewhat forced and unnatural in the context of questioning the moneylender. The most natural use for this ability would be as a spy or as a protective double. The world you have presented has parallels to Victorian England…would there be a Monarch? One way of introducing the concept would have been through a newspaper article reporting the death of one of the Monarch’s doubles. 2. You have shown that the Deathsniffer is great on following up quickly on clues and evasions. She is NOT however, great at following procedural investigation, something that, as her Assistant, Christopher could evolve as prompting her in, say questioning side characters, such as maids, butlers, etc. As well as taking on some of these duties himself. A possible amusing device, would be her discovery that he has been putting together a DS Handbook, with instructions in how to assist her, reminders, etc. 3. It might help the reader to have a better handle on the differing types of “wizards”, their abilities and the creatures that they control. A handy way of doing this would be to have Chris reminence about the trials and tests of classification during Categorization. Your next novel will give you excellent opportunities to expand on these and other aspects of your created world, along with another great ripping adventure! Loved loved loved your book. I can’t stop thinking about it since I finished reading it. Can’t wait to read the next book in hopefully a long series. Thanks so much for the entertainment. Thank you so much for your kind words!! I can’t wait to show the sequel off to everyone as soon as we can get it out and I’m so happy to know that you’re sticking around for it! Happy Holidays! Such a refreshing and unusual story. You have created such personality in the characters. I LOVED it, one of my favorite books of 2015! I will be waiting impatiently for the next in this series while wondering what is up with Christopher’s possible hidden gift. Looking forward to more dynamics between Olivia and Christopher AND what’s up with William, Hmmmmmm?? Thanks so much for the wonderful words, Sue! I really appreciate it and this comment made my day 🙂 Hope you tune in this August, you’ll definitely see all your wishes granted! Deathsniffers Assistant was one of the better books I have read in quite some time. I was rather surprise (and disappointed ) to see how few books you have written. Your writings comes across as being from someone with much more experience. 1. Your characters are Vivid. The descriptions, motivations, thoughts, and depth are wonderful. They come across as real people, as human and flawed as the rest of us. 2. The world you paint is both fantastical, and grounded in history, making it easy to visualize, and exotic at the same time. 3. In your blog, you say you are a feminist. However, none of that comes across. I did not see any kind of political bent to the story. All the charecters got their fair share of attention. Many authors have a hard time leaving out what makes them, them, and let the characters have thoughts and motivations unflavored by the authors. 4. Odd that it is, the most awkward part of the book was when a character used profanity. The terms you used were strictly modern, which just seemed out of place with the Victorian feel of the story. All in all, I am eagerly awaiting the sequel. Thank you so much for your lovely words, Loyd! I hope that you enjoy the next book as much as you enjoyed the first. Also, it may shock you to learn, a lot of the British slang I used was more modern, while the profanity was actually period appropriate 🙂 Our perceptions of what language was or was not are shaped a lot by television rather than history. 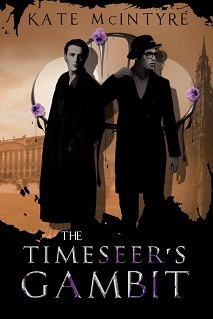 Just finished the Timeseer’s Gambit and enjoyed it as a great story as well as enjoying the development of characters, world definition and plot line follow-ups. The communication between Olivia and Chris – inferred, body-language and by just plain intimate knowledge of real meaning vs what is spoken, is redolent of the kind of characterization expressed between John D. McDonald’s characters Travis McGee and Meyer. In short – adult characters who THINK. The slow reveal of Christopher’s history and stunted childhood works very well, showing him to have a child’s view of right, wrong and what is appropriate. The early attempts to channel him from using his gift, is explained – since when it is used unfocused and coupled to emotion could be very dangerous. Unfortunately, since all his tutors were killed before teaching him exactly what his power is as well as when and how to use it, has left him as an intelligent, but emotionally stunted amnesiac. Thus his tendency to be easily overwhelmed emotionally and confused. As he discovers more of himself and now has a trigger for the use of his talent, it will be interesting to see as he incorporates more worldly knowledge. Christopher’s uptight simple view will be challenged, although he is well on the way of acceptance of Maris and Em’s lesbianism. More problematic, will be his relationship with William and William’s misplaced hopes. If I can anticipate, I believe that one part of being a Heart-Writer will be a good dose of Heart-Reader empathy – after all, you have to know what’s in someone’s heart, before you can re-write it in order to change their actions. His confusion from William is just the empathetic reflection of William’s desires and not his own – otherwise he would feel physical desire at the thought of consummation, rather than the sure knowledge that he can’t do that. His male interest in Rachel’s figure also points towards this. BTW, many writers link feminism and lesbianism – I think that they may go hand-in-hand, it certainly is not a rule. Olivia exemplifies her own brand of feminism, by her sure knowledge of self, her interest in male sexual partners that aren’t the usually socially accepted type and her refusal to abide by society’s laced-in rules for Ladies. Indeed she likes to tweak society’s nose by dramatic, but highly appealing mixing of gender fashions. In this she reminds me somewhat of Phryne Fisher. I hope you develop the character’s personalities as they reveal themselves to you, rather than sculpting them in such a way as expected by the so-called literary intelligentsia. THAT would be much to one dimensional and a real disappointment. Hope to see the next installment in the series soon!